A potential client recently said that they did not see value in social media for B2B. Yet, when it was suggested that their commercial sales channel partners would likely see value, they suddenly became interested. Why the conflicting reaction? Was it the potential contribution to the bottom line? Was it the fact that social media was being distanced from the corporation and therefore less likely to be a disruption to the status quo? 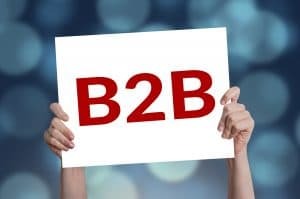 Regardless, there is a growing list of examples where social media has been used successfully within a B2B environment. Mashable lists fivegreat examples of success as well as specific tips for using social media for B2B activities. Still, these successes do not get as much press as the successes and failures with B2C. To be fair to my potential client, adoption of social media within a mature enterprise is not without its obstacles. We are no longer talking about social media marketing. We are now talking about incorporating social media into the fabric of the organization, into its day-to-day operations, its organizational DNA, rather than simply part of a marketing campaign. Many companies say that they are in social media because they set up a Facebook page and a Twitter account but if the links from your home page to either of those are broken or the content found there is infrequently updated or of limited value then they were probably better off not going into social media at all. I have often suggested that before an organization initiates a social media strategy, they must clarify their objectives, confirm that the right culture and capabilities exists within the organization to help the strategy succeed, and, finally, that the organization is prepared to manage the organizational and procedural changes required. This is where we will see more management consulting firms play a role in the broader strategic alignment and change management issues that social media raise. A recent piece by Accenture about social media in the insurance industry, describes a management framework that includes process, people, policies, and metrics to aid the incorporation of social media within the organization. Consultancies with social media expertise as well as strategic planning, organizational development, process improvement, and change management are well suited to these situations and can take the more holistic approach required than branding, PR, digital, or advertising agencies who, with all due respect, do not focus on those areas to the same degree. Agencies are also finding that there are struggles between them as to who can be prime when it comes to the client relationship on a multi-agency engagement. This is further exacerbated on the client side with more stakeholders coming to the table from disparate parts of the organization, all with their own requirements and expectations with respect to social media. Perhaps there is an opportunity for consultancies and agencies to collaborate on more comprehensive client engagements. While the organizational transformation driven by social media gets underway, there are still opportunities for early successes or, as the Heath Brothers say in their latest book, Switch, “bright spots.” These will help to build the momentum of change because they can be amplified as proof of the positive impact of social media. The following are just two examples of how social media tools, LinkedIn and Twitter, can be leveraged for business development and client engagement. They are also examples of social media that can be incorporated without raising many issues regarding social media use policies, privacy, or governance because companies are already aware of their employees being listed on LinkedIn and using Twitter simply as a listening or research tool has limited risk exposure for the organization. Where and how can organizations begin to incorporate social media in pursuit of early wins while the change management aspects continue in parallel? Facebook’s Mark Zuckerberg is credited with coining the phrase, “social graph” which, according to Wikipedia, has been described as “the global mapping of everybody and how they’re related.” I believe that it is this social graph idea that holds the key to achieving early success with social media for B2B. In a recent assessment of a client’s social media footprint, I discovered that less than 25% of their staff was on LinkedIn and those that were did not have very populated profiles with only a few connections on average. I am suggesting that organizations exploit the social graphs of their employees, assuming their employees are willing to cooperate. By that I mean, why aren’t companies getting as many of their employees to establish profiles on LinkedIn and connect to one another. That way the networks of each employee become transparent to all of the employees and the organization as a whole. Before you know it, Mary in sales will be able to determine that Bob in accounting is connected to Susan at a target account. Assuming Bob is comfortable, he can make a referral for Mary to Susan. Before LinkedIn, we did not know who within your network knew whom. Now you can map the people you know and who can provide you with a “favour of access” to someone in their network. This is a simple concept to leverage for business development but one that is surprisingly so infrequently exercised. This kind of initiative would have the added benefit of capturing the knowledge, experience, and skills of each of the company’s employees. If their own internal systems do not capture this kind of information to the same degree or at all then LinkedIn could serve as a complement to their operations. LinkedIn has already suggested that they intend to become a talent management platform so this would indicate that they are on the right track. Many people still say that they do not get Twitter. I can appreciate why this is possible. At first glance, Twitter can be overwhelming and it can take a bit of time to figure out its rhythm and etiquette. However, once people have their bearings, Twitter can prove to be invaluable for market and customer insights. Most of the hype surrounding Twitter speaks of the number of followers people have or strive to have. While followers are important over time, I encourage people who have just joined Twitter to be selective about who they follow at first. I also suggest that they use the search capabilities of Twitter or the filtering capabilities of third party applications like Tweetdeck to monitor what is being said about issues relevant to them and their organization. They can track what is being said about competitors, what key words are trending that are relevant to them, and how often and in what context people are mentioning the company. While listening they can engage customers who have an issue, thank a customer for a compliment, and speak to a potential customer who has a question or is frustrated with the service being provided by a competitor. Twitter also plays a critical role in helping to establish the organization’s more human or social side by being more conversational with stakeholders rather than just pushing information in one direction to them. If your organization is not predisposed to being social then social media may not be right for it or at least not right for it now. With social media, I am suggesting that organizations show more humanity or, as Jason Fallssays, “B2B is more P2P – people to people. The buyer still wants to buy from a trusted friend, not a logo or a company. “ Being more human is not always easy for an organization, especially in B2B, and it will take time to establish but once it does so, the payoffs will prove that the effort was worth it.